Im looking into doing this.. but does any one have a easy guide to all the parts needed? Can I use the whole MK4 shifterbox or is the Polo the way to go? Shifter: Mk4 inside a Polo box? Any one with the part numbers? There are three parts you need. The mk4 Polo shifter housing and baseplate, and a lever for the mechanism. The three parts allow you to mount the mk4 02J shifter mechanism in a housing which bolts in to the Corrado. Those are the only three Polo parts. All the others are mk4 (cables, tower, etc). They are about £50 new from VW. I've had a s3 shift mech, cables and tower kicking about for a while. I spent about two hourstrying to fit the shift mech into the tunnel but it was too big. Are the Polo parts still available new then? I don't suppose you have a photo of them? Thanks alot mate!! Found that there is a Polo -00 at the local junkyard... sweet! And the MK4 stuff... any part nr for those or should I look for a specific engine that have the O2J box? And the mounting bracket is the same on a Polo and Corrado? Thats why it fits..? Everything else is from a MK4 shifter... so I can take both and then swap the parts needed? Last edited by Wompa; 26th February 2011 at 12:00 AM. The parts are only from the diesel model, not all 6N Polos, so be sure it is the right one. As far as I know any mk4 shifter should work in this housing. The Polo tunnel is the same as the mk2 / Corrado, so thats why it fits, as opposed to the mk4 tunnel which is very different. 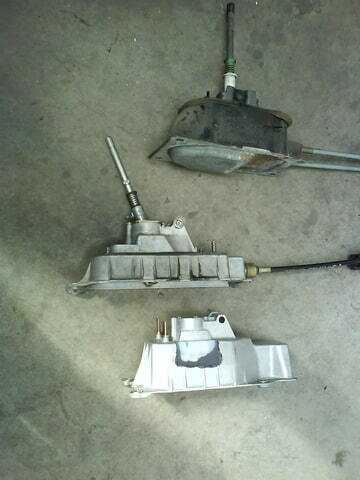 Basically you need a mk4 shifter setup and these three parts and you can build one that fits the 'rado. I'm pretty sure this setup fits the 02M as well - afaik that has the same shift tower as the 02J, but I'm not 100%. The Polo housing is at the bottom. what are the gains from doing this? mk4 golf 1.6 8v 4dr silver- for the family like! Aha... so its not all Polos that have that box... damn! Because they had two 6N Polos at the yard but not a singel TDI. What would I cost from VAG if I would order? Last edited by Wompa; 26th February 2011 at 11:26 AM. Ordered my Polo parts earlier and should have them in a couple of days. Will get it built up asap and postsome photos. I got quoted about 100eruo for all the Polo parts at VAG. Picked my parts up Thursday and spent today fitting. The shift mech bits fit inside the tunnel nice and easily. Need a couple of longer volts to fix it to the chassis but found some luckily. Getting the old tower out and new one in was a pig of a job, so much stuff in the way but managed it in the end, looks like adjustment will be nice and simple so will give that a go tomorrow. One thing: how do you get the reverse light working? The rado one sits on top of the tower, but the mk4 one has a threaded hole in the side. Do I need to buy an extra sensor to screw in?